Slyde is a new entrant in the ever-growing floating apps category of the Android platform that strives to take advantage of the big smartphone screens that are flooding the market lately. Those apps hover on top of anything else you are doing underneath, usually aiming to ease multitasking and one-handed operation. 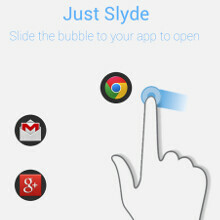 The Slyde app in particular is a simple task switcher, presenting in the form of a floating bubble that hovers on top of any screen you are currently looking at. It is small and transparent, so it doesn't get much in the way, and can be moved around as needed, or minimized to the status bar with double tap for when you are watching a video, for instance. The app lets you switch to five of your most used apps in a second by simply touching the Slyde bubble at the edge of the screen, and then sliding your finger to the five apps that appear in circles around it. It's faster and easier than having to constantly go to the app drawer or task switcher. Slyde costs $0.99, and doesn't require that your phone be rooted. Is task switching this hard for some? Yea actually, you can thank the retards at Samsung and LG for their archaic menu buttons for that. I have to agree on this one. Even though I really like the menu button, having to long-press the home button to switch apps is annoying sometimes. At least Samsung is ditching the Menu button on their new devices (but still lets people long press the multitask button to do Menu). wait for it.. wait for it.... wait for it.... GO! THE BEAUTY OF ANDROID! So it's like Windows. Great. I why WP doesn't have the same kind of multitasking as W8. Would be cool. Wow. I guess it is. I thought it was your 5 most recent apps, but it's "five favorite apps" according to the description. Nothing beats Switchr at this point. Looks nice. Thanks for the alternative suggestion. I'm gonna try it out later because there's a free version. This is only the beginning. We will see more optimization built in the OS as the phones are getting HUGE with 5.5" screens. Thank god software is pretty easy to manipulate. SwipePad has been doing this for ages beautifully.